We used to have a restaurant nearby called Fuzio’s that served a dish called Firecracker Fusilli. It went out of business here but I see that it is still in San Francisco and Modesto. Anyway, it was a spicy pork and pasta dish and John always used to order it. (I always ordered vegetarian pad Thai.) Yesterday he suggested we try making it with our never ending supply of pork from the pork shoulder we braised. In the recipe it said we were supposed to braise the pork in pineapple juice, soy, cilantro, ginger, and garlic. Since our pork was already braised, I made a sauce using those component ingredients in smaller amounts. You are also supposed to make a pesto out of habanero chiles but we used Fresno chiles. The whole thing is garnished with the pesto, sour cream, cilantro, and green onions. It was delicious. And with this dish I am done eating the pork and done eating out of control. We are going on an anniversary trip in about a month and I cannot keep up this pace and fit into any of my clothes. I told John to finish the pork tonight and I will go my own route. 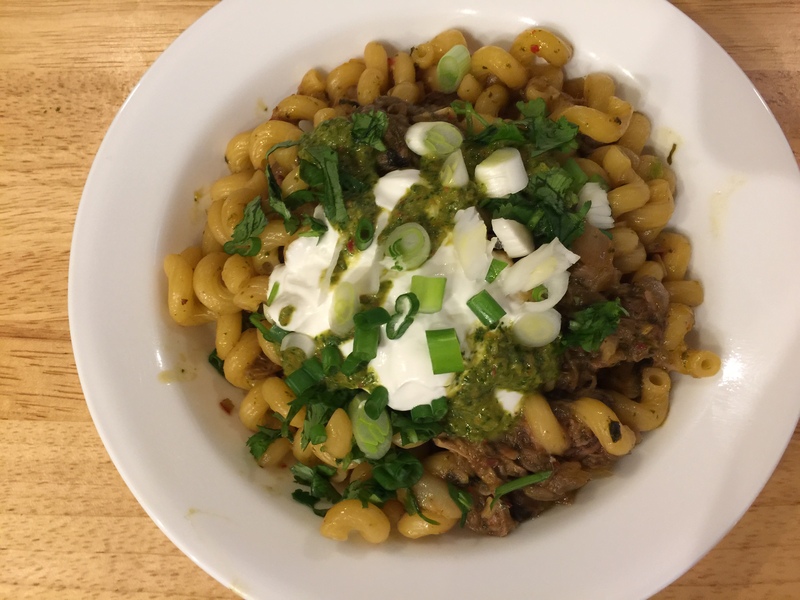 This entry was posted in leftovers, Pasta, Pork and tagged cilantro, Fresno chile, garlic, leftovers, Onions, pasta, pineapple juice, Pork, soy sauce. Bookmark the permalink.